Leave it to Steven Spielberg, once the wunderkind of exceptional blockbusters, now the grand master of elegant Hollywood craft (two sides of the same coin, naturally), to make a gleaming, watchable, propulsive, largely entertaining movie out of a screenplay that’s charitably a pile of schlock. Plus, he’s too good a storyteller to avoid uncovering some small complexity where a lesser filmmaker would find none. This is Ready Player One, loosely adapted from Ernest Cline’s junk sci-fi novel by Cline himself and Zak Penn, a movie set in a future overcrowded with people and problems. In mostly off-hand and off-screen ways, it imagines we stopped caring about everything wrong with our society – the climate, the class struggles, the over-commercialized corporate surveillance state, the shallowness – and just wallowed in a late-capitalist decay. That’s frightening enough, but it also sees the entire populace plugged into and swallowed up by a Virtual Reality world called The OASIS. Bouncing between a heightened reality and this over-the-top imaginarium, Spielberg finds his typically expressive mise en scene, energetically filmic camera, and crisp editing patter letting the screen overflow with digital mayhem while almost entirely avoiding the senseless repetitiveness of his knockoff sub-Marvel competition. Only he would think to stage a second act set piece inside a recreation of a famous 1980 horror movie (a fine extra-textual tip-of-the-hat to a fellow auteur) and not only get the set perfectly realized, but to get the grain right, too. The OASIS is an entire digital hellscape traveled via vision-enveloping goggles, omni-directional treadmills with bungee straps, and gloves and suits for sensory input. The thing is a combination social media and video game. There are casinos, branded game worlds, VR vacations, battles royale, sports, arcades, zero-G dance clubs, libraries, chat bots, and avatars representing several dozen Brand Name Intellectual Properties meant to be greeted with grinning recognition. It’s a chaos – like an entire universe made up of a Facebook that was also endless-Las Vegas inside a Grand Theft Auto Disney World – presented at once naïve and ugly (with just one winking nod toward the world’s digital Love Hotel pointing to how dirty the corners of such a place would inevitably become). I often found it flatly horrific, but the screenplay seems to find it praise-worthy. The structure of the story rests on a quest for three Easter eggs hidden by the late game’s creator (Mark Rylance). These special, well-hidden prizes, once obtained, will give the winner ownership of The OASIS, and thus, considering how many manhours and economic activity take place in the fictional space, the future itself. Spielberg splits the difference between my cynicism and the source material’s slobbering, following a team of scrappy underdogs fighting to beat cold-hearted corporate goons to the Eggs, while still fleetingly recognizing that maybe they should just unplug and chill out, at least for a couple days a week. So perhaps it’s a shade too acquiescent to its society – and, by extension, ours – taking a bland, gamified approach to pop culture. It's as visually clear as any Spielberg, but undoubtedly his most thematically incoherent. Our heroes – orphan Wade Watts (Tye Sheridan) and his online friends (Olivia Cooke, Lena Waithe, Win Morisaki, and Philip Zhao) who don’t know they all live in the same towering future-Ohio slums – view art and pop culture as trivia to be acquired, points to be won, hardly ever interacting with them as experiences or creations unto themselves. The kids mine the taste of the game’s creator – a child of the 80’s obsessed with Atari, John Hughes, Back to the Future, Van Halen and so on – for clues on how to win the game. It echoes the hollow nostalgia listicles and empty snark of some of the worst contemporary discourse from people who want points for catching references instead of experiencing and interpreting. But, though Spielberg serves it up, he can also see this problem. For all his rah-rah bombast about the underdog protagonists – and cheery hissing at the corporate baddies, including a boardroom tech company shark (Ben Mendelsohn) who is all-too chipper announcing they’ve been able to pinpoint exactly how many ads can be in one’s field of vision without “inducing seizures” – he watches as all their checklist skill pales in comparison to fleeting moments of real-world connection. OASIS may find them fantasy heroes, but the real world is where you can meet eye to eye, shuck off artifice, really know someone, and maybe even kiss. Only sometimes does the movie see this as the better option. The point, ultimately, is that the game’s creator, given a quiet, recessive affect by Rylance’s charmingly soft performance, was terrified of the real world. He hated his inability to connect with others and therefore built a digital simulacrum of his fantasy life and cultural diet to share, yes, but in which he could have complete control. All he wanted was to make people happy, but watched as people loved it so much it slipped out of his control, even as he was made into a tech god. (A slyly stupid faux-archival headline reads: “Bigger Than Jobs?”) His genuine, eccentric fanboy love and isolation is lost inside too much muchness. What to do with this tension in the larger context? Spielberg, similarly deified by many who see his creations as shallow entertainments and miss the real humanity in every frame, builds a film that’s a dazzling modern sci-fi construct (climaxing in a CG characters swarming a computerized battlefield) uninterested in the bigger picture. How does this world operate? What are its technological practicalities? What is its economic outlook? The movie doesn’t know or care. (This is no A.I. or Minority Report.) It’s simply attuned to the rhythms of the action bopping through eye-popping Janusz Kaminski frames – the washed-out reality intercut with a vivid, colorful, almost-real animated space. The performers are charming, the world is a constantly shifting fantasy of the creative and the derivative, and the spirited pace is zippy. Its vision of a fight to save a massive VR world is simultaneously Pollyannaish and cynical, twinkling Spielbergian touches over a yawning void. It’s exuberant celebration of shallow pop culture love, and a melancholy vision of the creator’s need to let go. It’s a busy visual explosion of an anything-is-possible tech-dystopia, and a recognition that no matter how fun a virtual world may be, it’s healthy to take a break. In the end, it’s perhaps the most excessive argument for moderation ever mounted. 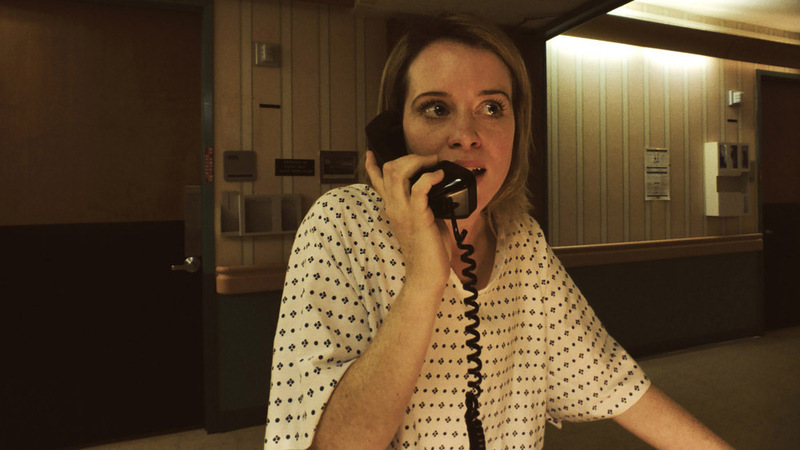 Unsane, Steven Soderbergh’s latest film, is a breathlessly suspenseful psychological thriller built upon a great lead performance, and an experiment in technical limitations. It finds tightly wound tension as a woman (Claire Foy) is involuntarily committed to a mental institution and therefore quickly pushed to her wits end. The more she loudly and wildly proclaims her sanity, the less the staff is likely to believe her, especially when the cops see the paperwork she signed, and the insurance company signs off on underwriting her stay. Shot almost entirely on iPhones, the perspective is unfamiliar, set on tables and desks, at unusually close or low angles a full-sized camera on a conventional set couldn’t possibly find. There’s a sense of tactile energy to the framing, and a crackling sense of unease in how unfamiliar the look becomes. This isn’t manipulated like Sean Baker’s Tangerine (the other major iPhone-shot feature) to have a rough-hewn beauty approaching the digital expressiveness of Michael Mann or latter day Godard. Soderbergh allows for the phone’s camera to manifest natural jaggedness in pans, slight wobbling of focus at the edges, tight aspect ratio that leaves black the edges of a properly sized and matted theater screen. Every interaction seems ripe with danger. The whole frame is closing in on its main character, trapping her as reality seems to warp and distort in the bugs of the visual information’s capture. The trick of the movie is the deceptively simple filmmaking and crystal clear screenplay by Jonathan Bernstein and James Greer letting suspicion cloud judgement. Maybe, the thought occurred to me early on, our protagonist really is in need of this treatment. She went to see a therapist about lingering uneasiness related to being the victim of a stalker (Joshua Leonard). She admits to occasional thoughts of self-harm. Then she’s asked back into the inner wards and locked in a seven day stay for her own good, cooped up with others (Jay Pharaoh, Juno Temple) who view her as one of them. Soon, she starts lashing out – striking an employee, berating her fellow patients – eventually appearing to hallucinate her stalker is one of the nurses at the facility. How easy it is to slip out of sanity, when stress is pushed to the limits. She feels trapped, held against her will, loudly protesting when no one believes her pleas. She is unsafe, she cries. No, say the doctors, she is simply unsane. Soderbergh takes her point of view at clinical face value, the great twist brewing in plain sight. He’s simply not trying to trick you, playing everything exactly straight, playing the audience’s doubts against his character. Foy does a Grade-A breakdown, expertly modulating her mood swings from exasperated frustration and wailing despair to violent disbelief or depressed resignation and back again as the week stretches on. As the film picks up in a pulpy fever pitch, it becomes a double-edged harm – from a health care system easily manipulated by corrupt individuals, and from the long-lasting effects of trauma. It’s as gripping an experiment as any Soderbergh has yet pulled off. The Strangers, writer-director Bryan Bertino’s 2008 debut, remains one of the most enjoyable “Look Behind You!” horror movies in recent memory. It used every inch of the widescreen and every degree of the lens’ focus to impeccable effect. The most memorable image drew a protagonist into the far right corner of the foreground while, unbeknownst to her, a woman in a doll mask stood eerily still in the far left corner of the background. Seeing it with a packed house made for fun shivery tension as the realization that the danger was inside the house and right behind her bubbled up in pockets and then all at once up and down the rows. A short, nasty work that found a couple terrorized by three masked home invaders, the movie made a brute no-nonsense contribution to the slasher subgenre, shirking the self-conscious and playing up the pain. Here was a movie that made the killers monstrous and unknowable, in it for the lark. The victims were neither brilliant nor dumb, just average folks caught off-guard by the terrible situation. Who wouldn’t be? Now the belated sort-of-sequel, The Strangers: Prey at Night, picks up the same thematic idea and applies it to a slightly bigger setting – this time a family of four trapped with three masked creeps (the same ones?) in an off-season vacation rental park – and filmed with more of a slick throwback approach. There’s a little synth here, some neon there. It’s all a tad more self-conscious about its place in the genre, but no less effective for it. Bertino co-writes with Ben Ketai for director Johannes Roberts (47 Meters Down), who treats the premise as an exercise in style and restraint, using slow zooms and patient medium shots in the early going as we learn about the family’s troubles and come to care about their slow-boil melodrama. Eventually, their problems don’t amount to much as they struggle to survive an inexplicable attack by the homicidal strangers of the title. Expert suspense sequences are staged and cut with precision, each more exquisitely directed than the last, culminating in a string of striking moments – a shimmering pool attack climaxing with a perfectly executed zoom that almost had me leaping out of my seat; a slow turn of a burning pick-up truck that had me bouncing my heels. The trick is that it’s not just showily well-calibrated to play old genre beats – though it does – but that it makes for a movie that’s as finely tuned to get the effects. All involved, from the cast (including recognizable talents like Christina Hendricks, Bailee Madison, Martin Henderson, and Bill Pullman’s son Lewis) to the filmmakers behind the camera (especially cinematographer Ryan Samul, who brings some of his Jim Mickle collaborations’ glossy tension), invest it with a convincing sense of surprised pain that helps the stylish touches crackle off the screen with just enough verve.